This week we began bringing in more of the red varietals, including almost 20 tons of Syrah and a small amount of Grenache. The Syrah is put into open-top tanks to ferment, and as the grape skins float to the top of the tank, we pump the juice over the top of the cap of skins. This process keeps the skins moist, and helps distribute the color and flavor of the skins throughout the juice. 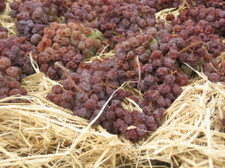 We’ve also picked the white grapes for our vin de paille (“wine of straw”) wines. Select bunches of Roussanne, Viognier and Grenache Blanc grapes have been laid out on straw beds in our greenhouses to dry out. As they turn into raisins, the sugars and juice is concentrated (and the skins turn dark). This is a traditional method for producing sweet wines in climates that are neither susceptible to botrytis nor consistently cold enough to produce ice wine. We’ll probably press the grapes within the next few weeks and age them in barrel, to produce our sweet dessert vin de paille wines.